A picture is worth a thousand words. How many does it take to tell Asphalt Green’s complete story? If you ask Asphalt Green’s photographer, Poby, the answer is more than 100. That is how many images make up the new collages you see when you walk through the doors at Asphalt Green’s campuses. Poby, who has worked with Asphalt Green for over 10 years, came to us with the idea to create the piece in 2013, when our Battery Park City location was set to open and our Upper East Side campus was being updated. With a vision of combining historic pieces with his contemporary work, he collected all of our photographs, founding documents, original blueprints, and any other milestones we had documented. Then, he started the process of sorting and scanning everything with his post producer, Christian DiNapoli. From there, the collage started to come together. Each image was designated its own layer. Some photographs were enlarged, some were made smaller. The colors and grain were adjusted, so each image blended with its neighbor. Some photographs were shifted a quarter of an inch and others an inch. After hours of cropping, rotating, flipping, and swapping, the piece was complete in about three months. The beauty of the piece is it captures the overall feel of Asphalt Green through color. He hopes people are drawn in and feel happy, proud, and motivated because of the positive energy it exudes. Poby picked up his first camera, a Super 8 movie camera, when he was 12 years old. He was immediately drawn to photography because you can express yourself faster with a camera compared to other art forms. He started his professional career at a sports agency in Munich, then attended school for graphic arts and design. Poby has covered many high-profile athletes and sporting events, including the Olympics and World Cup. 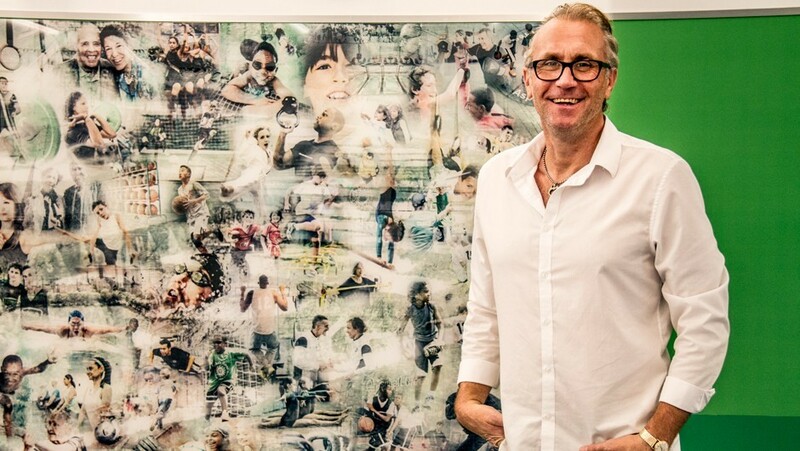 As a former professional athlete on the German water polo team, he gravitates toward sports photography. He credits his experience as an athlete for his uncanny ability to capture the emotion of each sport and competitor and connect it with art.